After the Spoke-n-Sport New Year's Day Ride everybody's on pace for a 5,000 mile year. Sometime last February my TV stopped working. I may have missed a memo but whatever. There's plenty of good material on the intertubes. A remarkable theme emerged for me over the next few days. In his superb TED Talk Kunstler says, "Life in the mid 21st century is going to be about living locally. Be prepared to be good neighbors." It’s his final point. Watch the whole talk at the TED website. Later in the week Krista Tippett talked with Bill McKibben on her Speaking of Faith program. He’s "founder of 350.org, a global climate campaign named after what scientists deem the safe level of carbon dioxide in the atmosphere, 350 parts per million." Krista says he’s written, "Research has shown that when we live on car-filled streets our number of close friends drops by half. We eat half the meals we used to with friends, family, neighbors...The big question for this century may turn out to be how fast we can relearn the skill of neighborliness." So Merry Christmas! I celebrated numerous times this week the birth of the man who got killed for saying crazy things like “The second greatest commandment in the bible is to love your neighbor as yourself.” What was true 2000 years ago is confirmed by many of my favorite people today. This evening as I prepared my wardrobe for the ride home I found myself facing a zipper problem. The Fox Stormfront jacket that I celebrated in this blog post from January 2006 had developed a faulty zipper. This was critical. 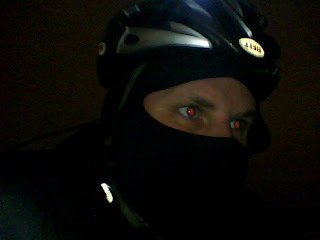 I was desperate for time and facing the necessity of riding home in mid-teen temperatures with an unzipped jacket. Luckily a second zipper pull on the jacket saved me. Now I'm looking with suspicion on my other single zipper pull jackets. I don't know if I'll be able to trust again. I stood and spoke favorably to the City Council tonight about the Shape Sioux Falls 2035 Comprehensive Plan. There are verified reports that Mr. Bite did as well but he availed himself an earlier opportunity. I did not see him nor hear his words. I find myself contemplating the replacement of TV with real tangible experiences – and I consider that I might be on to something. In front of me was the mayor whom I'd handed a LAB Bicycle Friendly Community award to a couple months ago. To my left was councilor Kenny Anderson whom I'd last seen (and mostly first seen) less than a week ago inside the Kenny Anderson Community Center. We were presenting the FAST/Leaders Park plan to some of his constituents. I was highlighting some of my favorite bits of the plan and got to corridors. In an attempt to demonstrate the importance of planning corridors I suggested one need only watch a group of teenage girls try to walk from the Empire Mall to the Empire East Mall to realize corridors need attention. I relinquished the podium. The next man to speak identified himself with his name, his address, and his high level position at the Empire Mall - "thank you very much” – which received a fair amount of laughter.